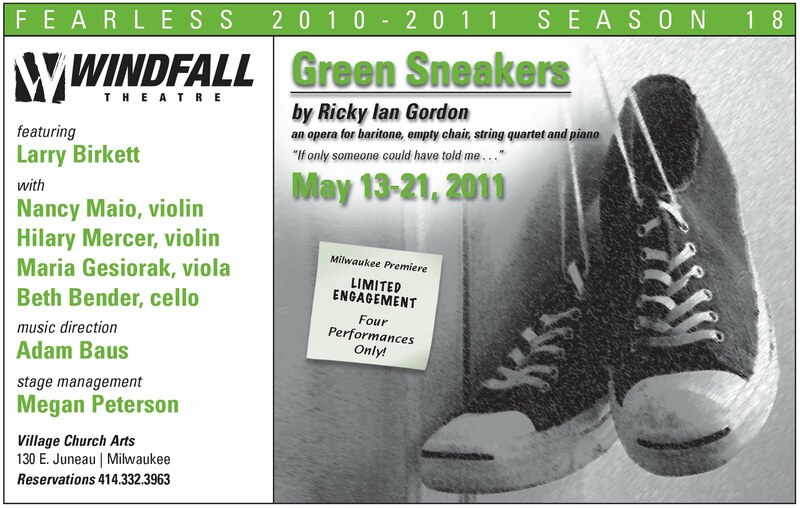 Windfall Theatre concludes its all premiere 18th season of Fearless theatrical adventures with the Milwaukee premiere of GREEN SNEAKERS an opera for baritone, empty chair, string quartet and piano by Ricky Ian Gordon in a limited engagement 4 show run staged in the company’s intimate performance space located at Village Church Arts, 130 East Juneau Avenue, in the heart of Milwaukee’s downtown theater district. GREEN SNEAKERS continues Windfall’s mission of bringing little known theatrical gems to Milwaukee audiences. It was commissioned by the Bravo! Vail Valley Music Festival and received its world premiere on July 15, 2008. The much anticipated recording of GREEN SNEAKERS premiered on World AIDS Day 2009. The score was published in February, 2011. About the opera: Ricky Ian Gordon’s GREEN SNEAKERS an opera for baritone, empty chair, string quartet and piano is an intimate and deeply personal song cycle recounting Gordon’s coming to grips with his partner dying of AIDS as his operatic adaptation of the TIBETAN BOOK OF THE DEAD was coming to life in 1996. Gordon’s poetic lyrics and hauntingly beautiful music play tribute to his partner and speak with poignant truth to anyone who has experienced the loss of a loved one. “On August 1, 1996, my late partner, Jeffrey Grossi, passed away. There was a day when I was staring into our closet…and his sad little green sneakers suggested to me a text, about the day we bought them together…what ended up becoming a cycle of poems, tell the story of that day, and the period after, leading up to his death. They end with my…pilgrimage to a place where I had hoped I might find others, who had gone through what I had just gone through, and could empathize." About the composer: Ricky Ian Gordon is an artist of diverse talent writing vocal music that spans art song, opera, and musical theater. His songs have been performed and recorded by internationally renowned singers Renee Fleming, Dawn Upshaw, Audra MacDonald, Kristin Chenoweth, the late Lorraine Hunt Lieberson, Frederica Von Stade, Andrea Marcovicci, Harolyn Blackwell, and Betty Buckley, and many others. His recent works include: SYCAMORE TREES and THE GRAPES OF WRATH. He is currently working on commissions for New York's Metropolitan Opera with Playwright, Lynn Nottage, and is also writing a new musical for Playwrights Horizons with Richard Nelson. He has taught Master Classes and Composition Classes in Colleges and Universities throughout the country including Yale, NYU, Northwestern, Juilliard, Carnegie-Mellon, Michigan State, and San Francisco Conservatory. He has been the featured Composer-in Residence at various festivals including The Hawaii Performing Arts Festival, Aspen Music Festival, and Ravinia. His honors include many awards from ASCAP, The National Endowment for the Arts, the Shen Family Foundation award and the Stephen Sondheim Award. 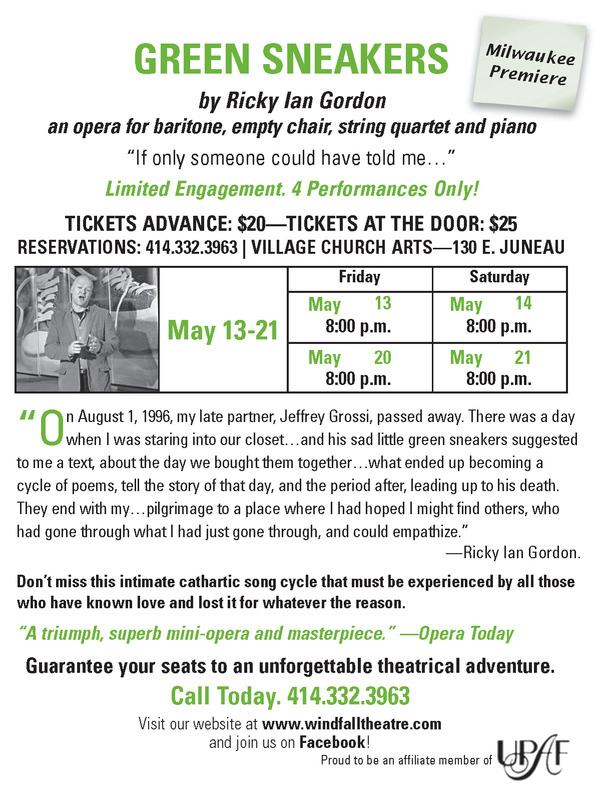 About the ensemble: Windfall ensemble member Larry Birkett (baritone) is joined by gifted Milwaukee based musicians Nancy Maio (violin), Jessicca Williams (violin), Maria Gesiorak (viola) and Beth Bender (cello). Adam Baus is musical director and Shawn Gulyas directs. GREEN SNEAKERS is an intimate cathartic song cycle that must be experienced by all those have known love and lost it for whatever the reason.